The goddess Serket was associated in Ancient Egypt to the scorpion and to the waterscorpion. Scholars have usually cosidered the ancient Egyptian goddess Serket as a goddess scorpion, whose harmful bite made her an effective protection against poisonous stings. Not for nothing, Serket is invoked in many remedies against scorpions bites. 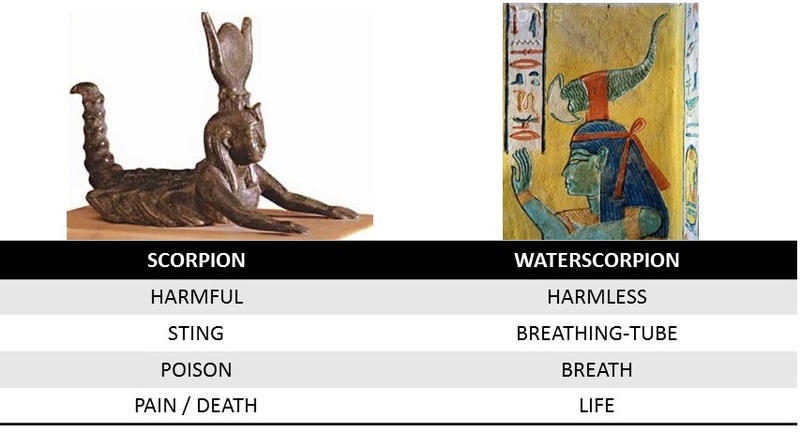 But the animal in the head of this ancient Egyptian goddess when she is depicted as a woman, although similar to a scorpion, seems to be a nepid, that is a water scorpion, which is a harmless insect that lives in the marshes.